Wholesale plagiarism is was common in early printed books. Printers, book sellers, and readers even had a word for it: piracy. When dealing with short, cheap pamphlets, this piracy often took the form of wholesale plagiarism. A printer would acquire a copy of one pamphlet, reset the type, find a handy woodblock lying around the shop to use as a title-page illustration, and print up a bunch to sell locally. This is precisely what happened in the case of Georg Tannstetter’s judicia for 1512. Astrologers produced judicia or practica each winter for the following year. These short pamphlets contained general predictions for the coming year based on the relevant astronomical phenomena—the planetary ruler of the year and any eclipses or conjunctions. In addition, judicia contained predictions related to crops, war, famine, disease, success or failure of the different groups of people, e.g., merchants, farmers, princes, priests, academics, and finally weather. They were frequently produced by a local astrologer associated with the court or the university, for a specific city, and appeared in both Latin and the vernacular. By 1512 Tannstetter had been at the University of Vienna for a number of year, had worked his way into imperial court ciricles in Vienna, and had produced judicia for at least five or six years. 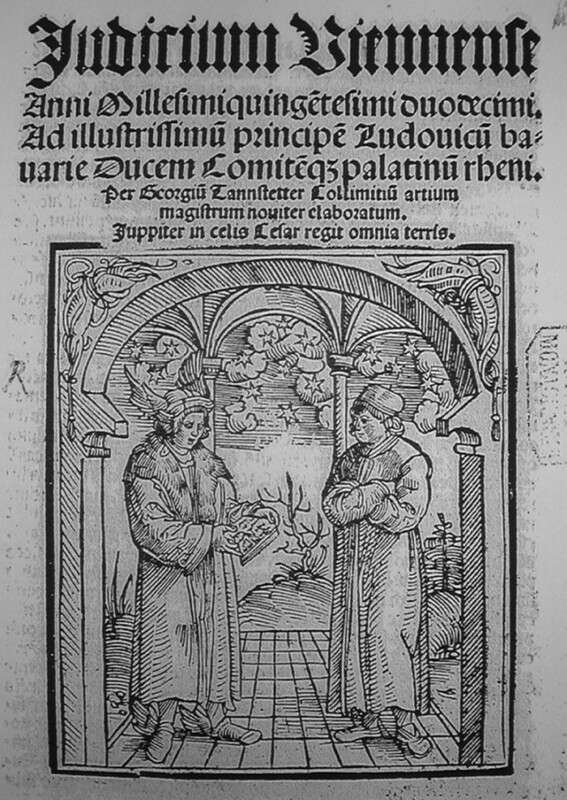 In the winter of 1511 he produced his Judicium Viennense for 1512, which was printed by the Nuremberg printer Wolfgang Huber. Huber also printed Tannstetter’s wall calendar that accompanied his judicium. The two were linked visually by a shared woodcut illustrating the title page of the judicium and the bottom of the wall calendar. 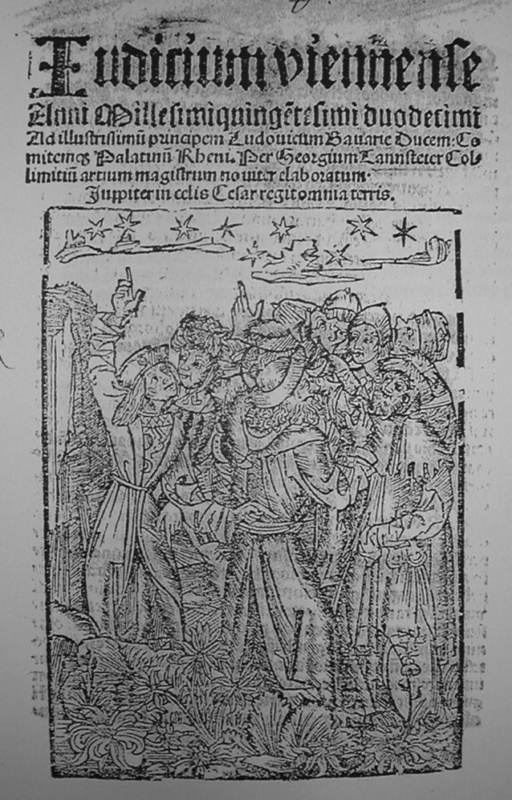 This woodcut depicted the planetary ruler and co-ruler for the year: Jupiter and Mercury. Almost immediately, Henricus Nussia in Cologne produced a quick knockoff of Tannstetter’s Judicium Viennense . Nussia dug around his shop for a reasonable woodcut—a crowd of astrologers and onlookers pointing up to the stars—for his title page. The text of the judicium is largely unchanged, except for various errors introduced in the typesetting process. He does not appear to have pirated the wall calendar, which would have been much more labor intensive and expensive to reproduce. In this case, Nussia’s motivation seems pretty clear: profit. Judicia were inexpensive to produce and sold well. It seems a different goal motivated the plagiarism in a pair of pamphlets from the late 1650s. 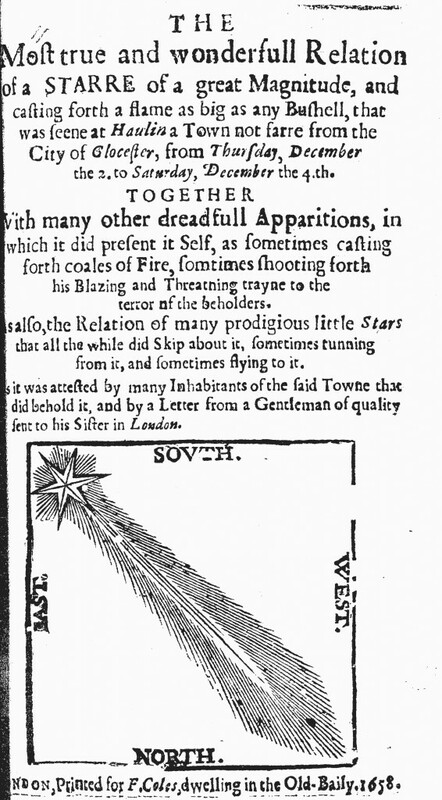 In 1658 an anonymous pamphlet was published offering interpretations and predictions of a recent comet along with other celestial phenomena: The Most True and Wonderfull Relation of a Starre of a Great Magnitude, and casting for a flame as big as any Bushell . The details—dates, locations, events—in this passage encourage the reader to imagine the events as if he (or in a few cases, she) had witnessed them directly. It is the observation of a Learned man, that some places by the divine Providence are more appropriate for Miracles then [sic] others, not that the hand of GOD is confined to any place, but that hee is pleased there more particularly to exercise his Power, and to manifest eyther his [sic] Indignation or his good pleasure to the Sons of men; of this the Histories both Sacred and prophane can furnish us with abundant examples, had wee the leasure to prosecute so large a Theame. As is common, the pamphlet then discusses comets in general, citing no less an authority that Tycho Brahe amongst the “many great Schollers [who] have written large Treatises” on them. It then detours into historical examples of comets. It recounts a story of when King James and his court were hawking and hunting. The king was startled by the appearance of a “Blazing-Starre” and sought the advice of learned mathematicians at Cambridge. In the end, however, the king rejected their ambiguous interpretation and offered his own: “it [the comet] fore-telleth, that the greatest Smart of it, and the sharpest Execution of all shall befall on Me, or my Children.” In 1658 every reader would have appreciated how true King James’s prediction turned out to be. Finally, the pamphlet returns to the particular comet that occasioned its printing. The predictions are, well, ambiguous. Often, the pamphlet claims, comets presage wide-scale death and dying and the deaths of princes. But other times they have presaged wonderful events, like the “Starre in the East” that guided the three wise men to Jesus. While the whole pamphlet is fascinating, I want to look now at a pamphlet printed the following year. 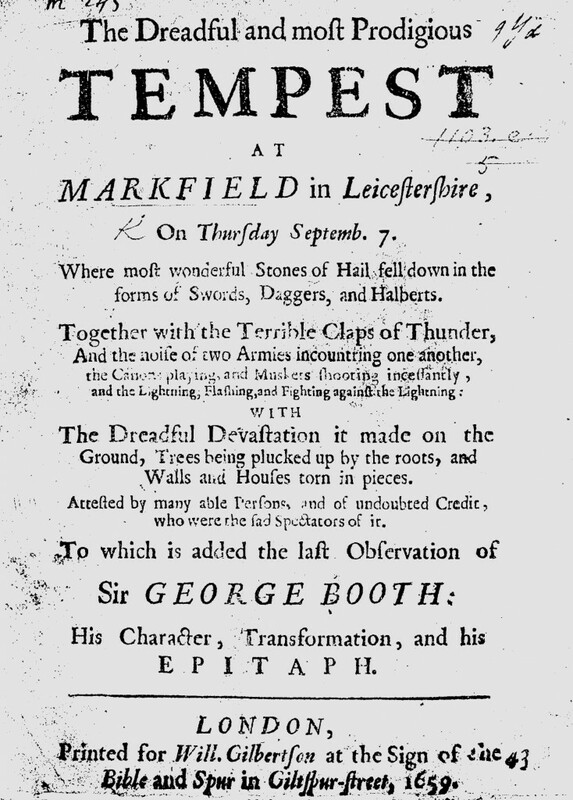 The Dreadful and most Prodigious Tempest at Markfield in Leicestershire promises to interpret a series of prodigious hailstones, claps of thunder that sounded like two armies clashing in the heavens, lightning, and a storm that uprooted trees, walls, and houses. Before I proceed to give you an accompt of the many admirable and prodigious formes of haile-stones, which in a great storm of thunder and lightning, were taken up and shewed to many at Markfield in Leicestershire, on Thursday the 7th of this present moneth of September, it will not be amiss to represent unto you, that it is the observation of some learned men, that some places by the Divine Providence, are more appropriate for miracles then [sic] others; not that the hand of God is confined to any peculiar place, but that he is pleased there more particularly to exercise his power, and to manifest either his Indignation, or his good pleasure to the Sons of men: Of this the Histories both sacred and profane, can furnish us with abundant examples, had we the leisure to prosecute so large a Theam. …but in the shapes of Men and Coaches drawn by horses. In Germany about twelve years since, there was seen the shape of a Man in the Air, sitting in the clowds, and cloathed all in white, on his brows were to be seen the rays of Divinity. Those that behled it, did entertain in their hearts the preparations for Repentance, and amendment of Life, believing they had seen some sign whereby they might justly suggest unto themselves that the Resurrection was at hand. In The Most True and Wonderfull Relation of a Starre of a Great Magnitude the text is identical, except the author noted that it had been “eleven years since.” In neither pamphlet do we learn what consequences resulted, if any. All we learn is that the people who witnessed this man crowned with “the rays of Divinity” encouraged people to amend their ways. We don’t even learn any more about this prodigious apparition, such as where in Germany he was seen. What event in Germany occurred in 1647 that was so significant to an English audience? Diplomats were working to bring the 30 Years War to a conclusion, but the Peace of Westphalia was still a year or more away. Was there a significant, more local event that attracted English and perhaps international attention? And did this example get reused in other English pamphlets during the 1650s? These passages seem too similar to be explained away as mere coincidence. Perhaps both The Most True and Wonderfull Relation of a Starre of a Great Magnitude and the later The Dreadful and most Prodigious Tempest borrowed from an earlier pamphlet, or perhaps the later pamphlet borrowed from the former. Or perhaps they both borrowed from and in turn propagated a broader set of meaningful practices, tropes, and structures that readers expected when they turned to this pamphlet literature. These two pamphlets alert us to those practices, tropes, structures, and expectations and encourage us to think about how they functioned and what sort of authority authors, printers, and readers attributed to them. The standard story about science in the Roman world condemns it to the realm of engineering and the application of Greek science to practical problems. To the extent that Romans acquired scientific knowledge, it was through popularizations and translations, often with commentary, of Greek works. Roman science conjures up images of Macrobius’ Commentary on the Dream of Scipio , Martianus Capella’s The Marriage of Philology and Mercury , Lucretius’s On the Nature of Things or, perhaps most damningly, Pliny’s encyclopedic Natural History . As David Lindberg put it, “Such science or natural philosophy as Romans knew, then, tended to be a limited popularized version of the Greek achievement” (Lindberg, The Beginnings of Western Science (Chicago, 136)). 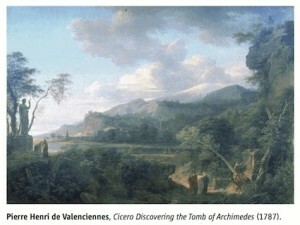 Pierre Henri de Valenciennes’s Cicero Discovering the Tomb of Archimedes (1787) (screen shot from Pesic’s review). According to Peter Pesic, a new book by Daryn Lehoux challenges this standard story: “What the Romans Really Knew” reviews Lehoux’s latest book, What Did the Romans Know? (full review and the pdf are behind a paywall). Apparently, Lehoux begins by “correcting a long-standing view that the concept of ‘laws of nature’ only originated in the 16th century” (Pesic, 273) by focusing not on the words Romans used to describe their ideas but the content of those ideas: “consider whether the Pluto Platter really changed its essence in 1957, when its manufacturer renamed it ‘Frisbee’” (Pesic, 273). Such an argument is grounded in a particular historiographic assumption that identifies the essence of ideas and distinguishes them from the words thought to express those ideas. There is considerable philosophical and historiographical support for such an assumption and as much philosophical and historiographical opposition to it. I admit I am skeptical of being able to identify the essence of an idea distinct from the particular words used to articulate that idea. But given that Lehoux’s earlier book, Astronomy, Weather, and Calendars in the Ancient World is very good, I look forward to reading his new one. In his Warming up Patrick Rhone points to the value of writing anything first thing in the morning. He borrows from Julia Cameron’s “morning pages,” popularized in her book The Artist’s Way . Like Rhone, Roxana Robinson’s morning routine includes both coffee and writing. For Rhone, Robinson, and Cameron the morning routine awakens creativity. Whatever mechanism links these morning routines to creativity, the key seems to be in establishing a routine. In “Blocked” Joan Acocella offered a number of examples of authors who were both creative and productive. In each case, creativity was subsumed under their routine. Maybe we need to invert our easy assumption: They didn’t write because they were creative. They were creative because they wrote. The many studies by Robert Boice seem to reinforce the importance of routine—short, scheduled writing—not just for quantity but also the novelty or creativity (however that is measured). The act of writing stimulates creative thought, it seems (see this recent analysis and this one for further discussion and some numbers). Perhaps we, students and faculty, should rely less on technological solutions, though there are many of those, and more on the low-tech and decidedly unhip routine. In most departments, and not least in science, a certain blind assurance prevailed, distorting observation and undermining judgement. The physicists, the guild whose later discoveries would shake the foundations of civilization, were wide of the mark in their neat assumptions about the nature of the physical world: they did not, as Henry Adams soon discovered, accept radium easily. Having forgotten the enlightening intuitions of Michael Faraday, who from the beginning had rejected their too tidy conception of atomism, the exponents of the exact sciences were convinced that they had already staked out the ultimate boundaries of the material universe and that no new discoveries of radical importance would be made; their ideology found no place for invisible internal activities or unfathomable depths. Lewis Mumford on science at the turn of the twentieth century. L. Mumford, My Works and Days (1979), p. 4. The History of Science is not a mere record of isolated discoveries; it is a narrative of the conflict of two contending powers, the expansive force of the human intellect on one side, and the compression arising from traditionary faith and human interests on the other. For this reason I have had little to say respecting the two great Christian confessions, the Protestant and Greek Churches. As to the latter, it has never, since the restoration of science, arrayed itself in opposition to the advancement of knowledge. On the contrary, it has always met it with welcome. It has observed a reverential attitude to truth, from whatever quarter it might come. Recognizing the apparent discrepancies between its interpretations of revealed truth and the discoveries of science, it has always expected that satisfactory explanations and reconciliations would ensue, and in this it has not been disappointed. It would have been well for modern civilization if the Roman Church had done the same. As to Science, she has never sought to ally herself to civil power. She has never attempted to throw odium or inflict social ruin on any human being. She has never subjected any one to mental torment, physical torture, least of all to death, for the purpose of upholding or promoting her ideas. She presents herself unstained by cruelties and crimes. But in the Vatican—we have only to recall the Inquisition—the hands that are now raised in appeals to the Most Merciful are crimsoned. They have been steeped in blood! There are two modes of historical composition, the artistic and the scientific. The former implies that men give origin to events; it therefore selects some prominent individual, pictures him under a fanciful form, and makes him the hero of a romance. The latter, insisting that human affairs present an unbroken chain, in which each fact is the offspring of some preceding fact, and the parent of some subsequent fact, declares that men do not control events, but that events control men. The former gives origin to compositions, which, however much they may interest or delight us, are “but a grade above novels; the latter is austere, perhaps even repulsive, for it sternly impresses us with a conviction of the irresistible dominion of law, and the insignificance of human exertions. In a subject so solemn as that to which this book is devoted, the romantic and the popular are altogether out of place. He who presumes to treat of it must fix his eyes steadfastly on that chain of destiny which universal history displays; he must turn with disdain from the phantom impostures of pontiffs and statesmen and kings. Predictably, Draper violated his own injunction and wrote largely an artistic history, populated by a handful of heroes and as many villains, and a generous helping of romanticized conflicts between them.